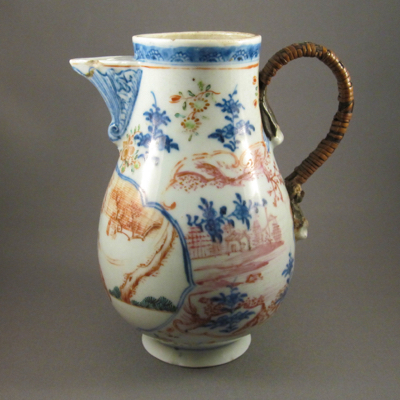 This baluster shaped milk jug with a molded spout was made in the style of European silver and decorated in the Famille Rose palette, using cobalt blue, green, puce, and iron-red enamels. 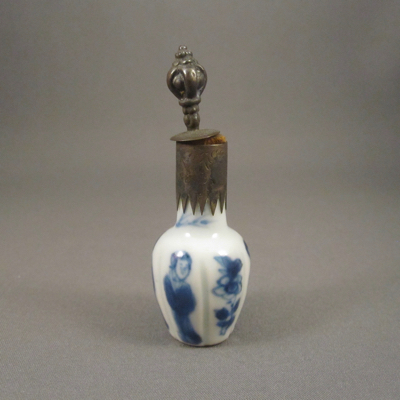 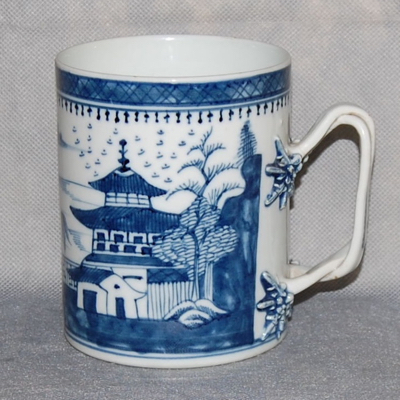 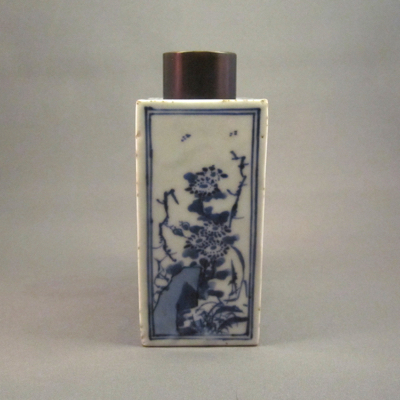 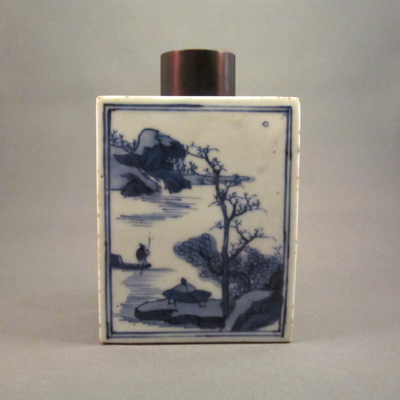 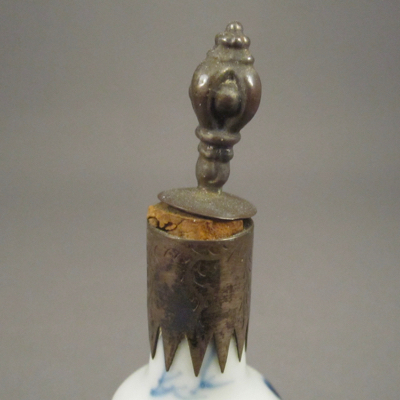 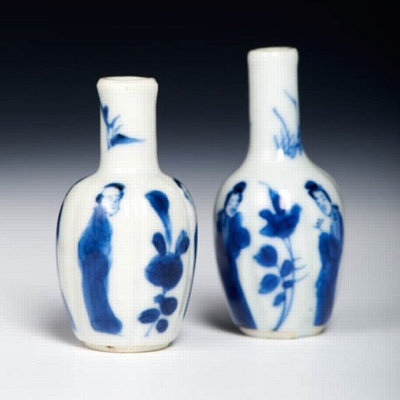 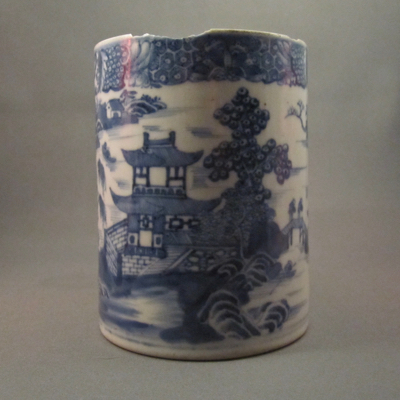 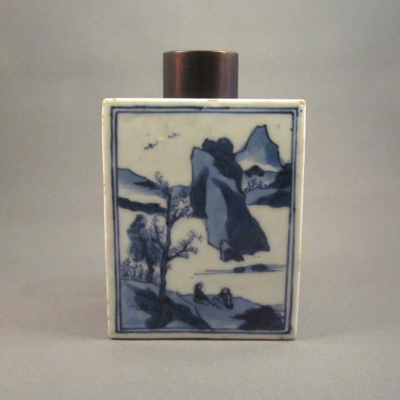 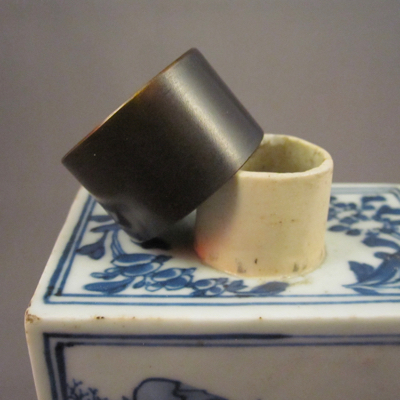 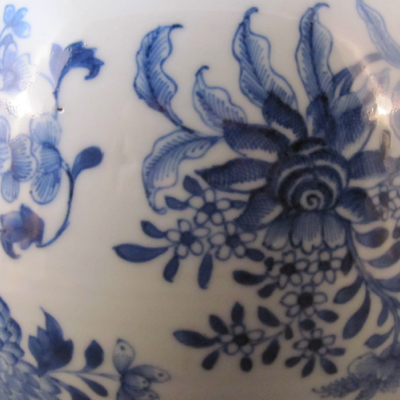 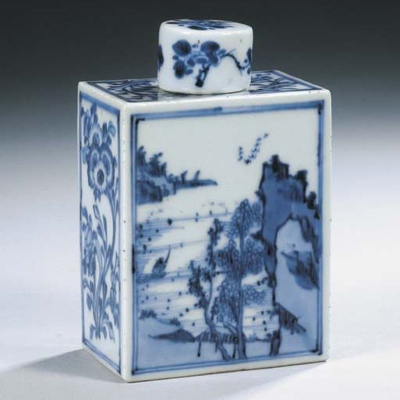 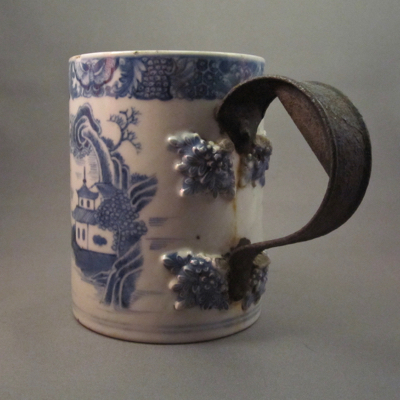 It was made in China during the Qianlong period (1736-95) and measures 7 inches high. 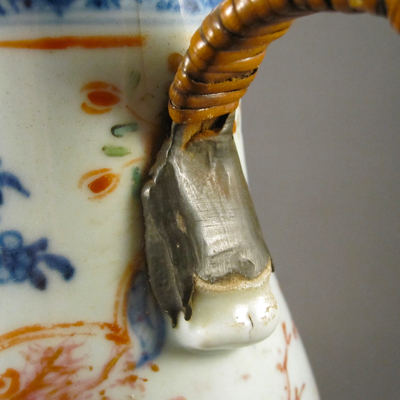 Sometime in the late 1700s to middle 1800s, a metal handle wrapped in rattan was added, replacing the original broken one. 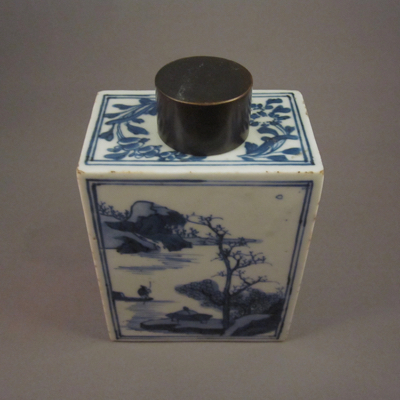 To add insult to injury, the lid went missing at one point over the past 250+ years. 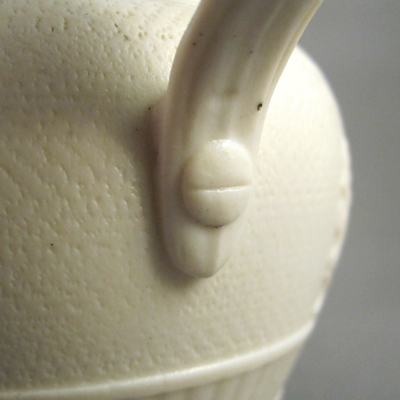 It’s too bad a replacement lid wasn’t made at the time the original one was lost. 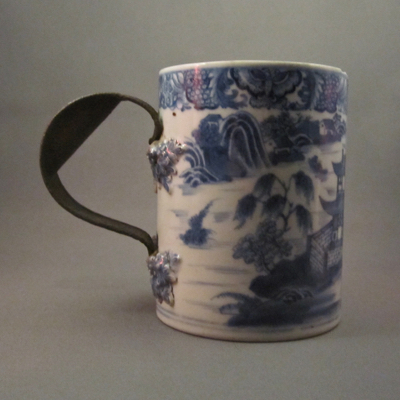 I may attempt to make a new one, that is if my tin making skills improve. 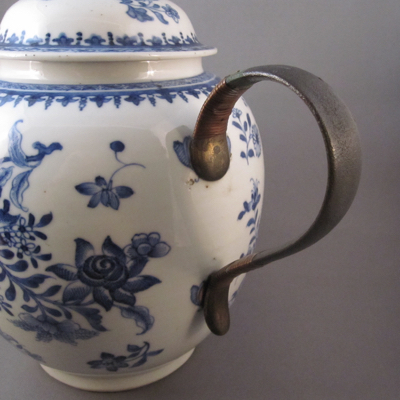 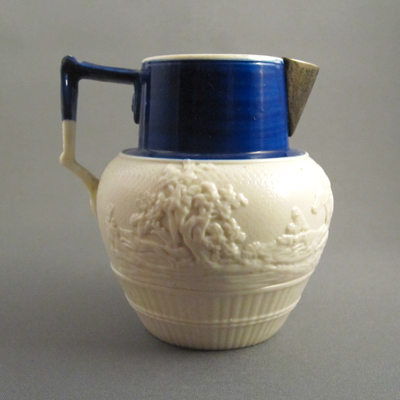 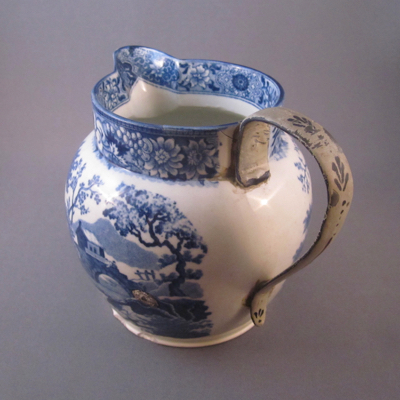 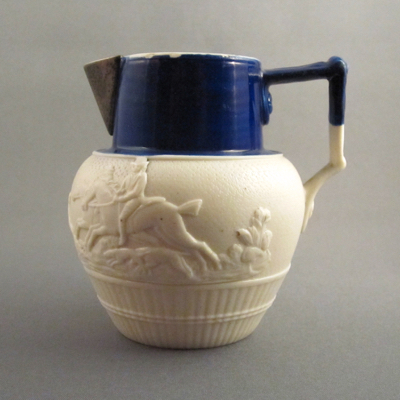 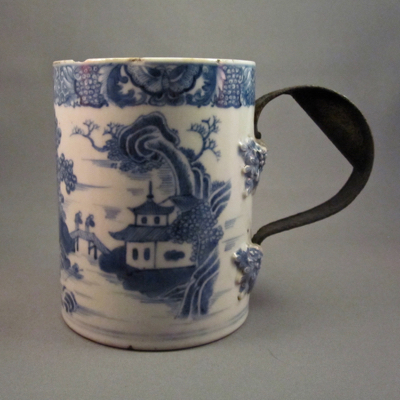 This milk jug with similar form shows what the original handle on mine might have looked like. 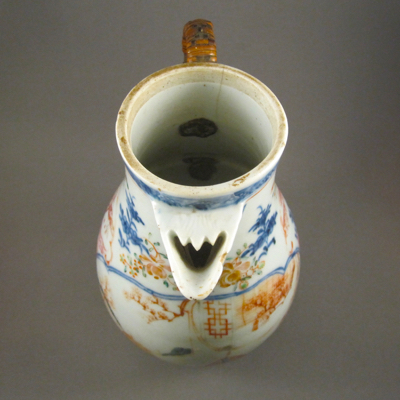 This Dutch form pottery jug with pearlware glaze and sparrow beak spout was made in England in the first quarter of the 19th century. 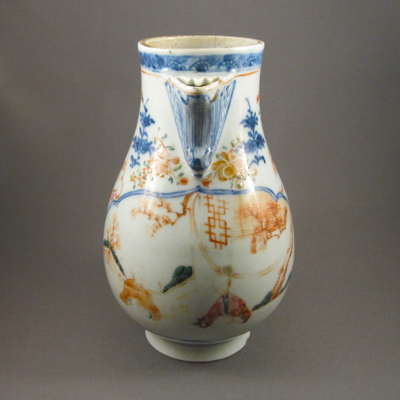 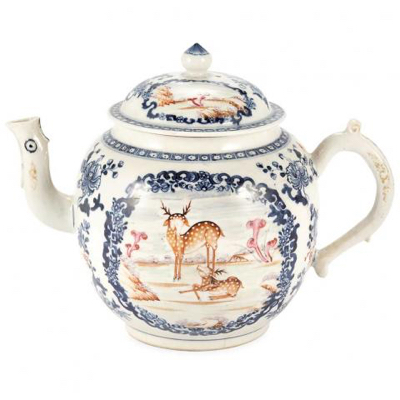 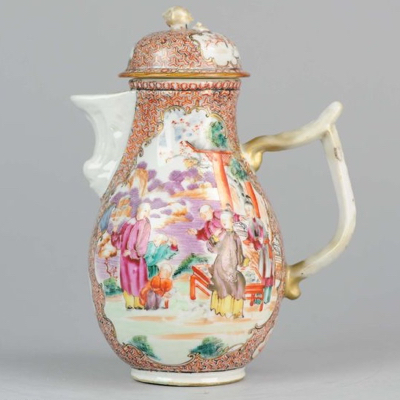 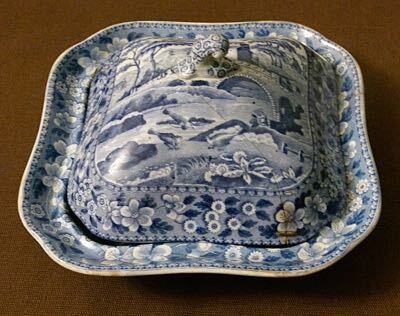 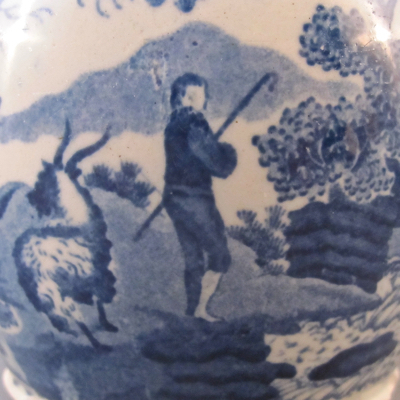 Standing nearly 4.25 inches high and 5.75 inches from handle to spout, it has blue transfer decoration, combining a pastoral scene with a shepherd, ancient ruins, and a lush border of flowers and fruit along the rim. 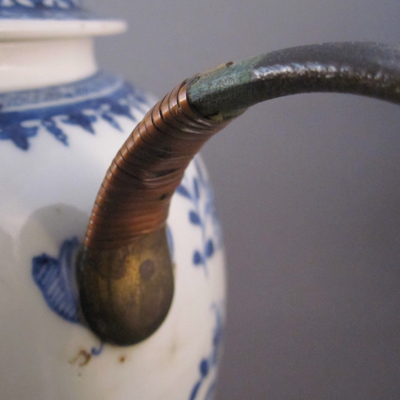 Well over 100 years ago, the original loop handle became detached and immediate surgery was needed. 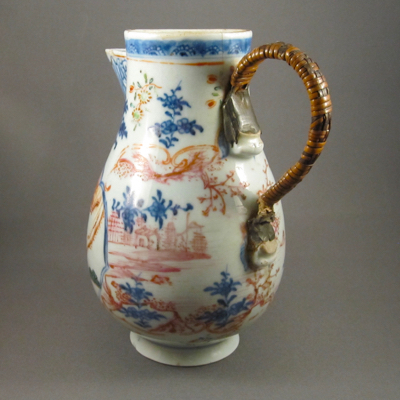 Luckily for the jug and its owner, a tinker made a metal replacement handle and bolted it to the jug. 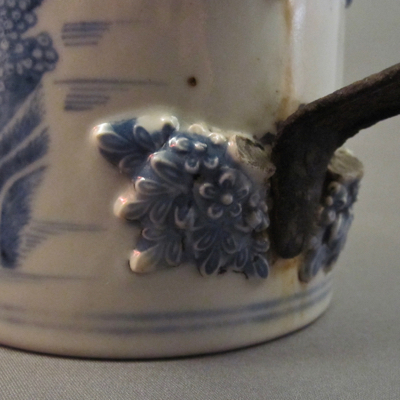 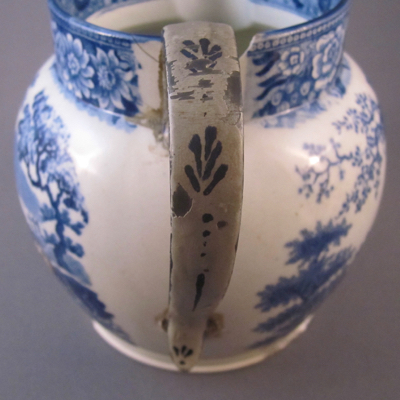 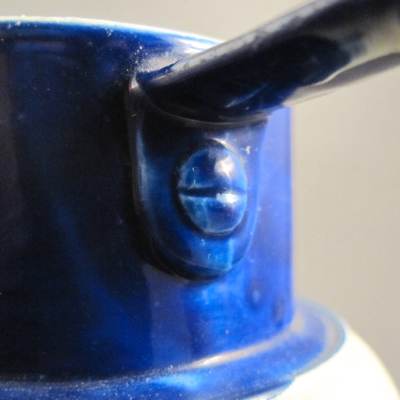 To help mask the repair, the new handle was painted blue and white to match the existing decoration. 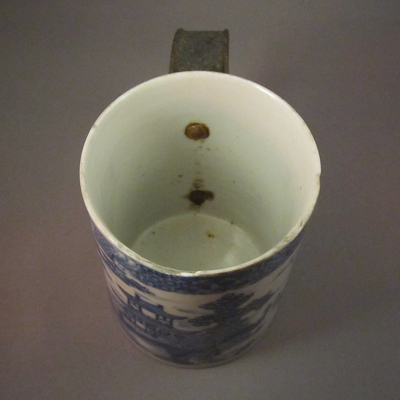 Curiously, a hole on the side was filled with lead, much like a cavity in a tooth. 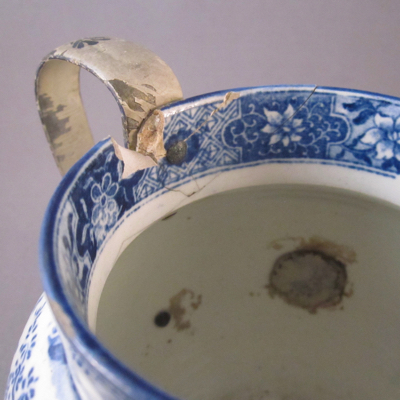 Not the most elegant repair job I have seen but it certainly does the trick. 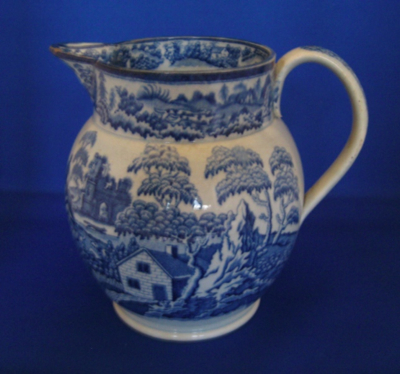 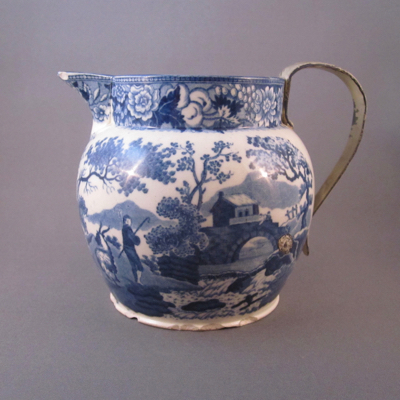 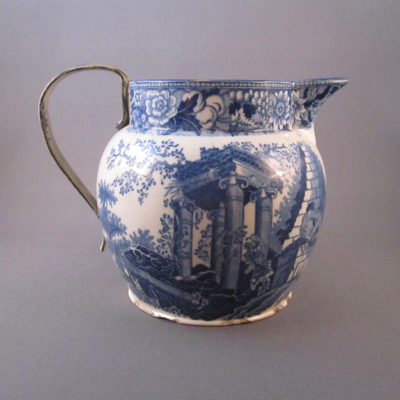 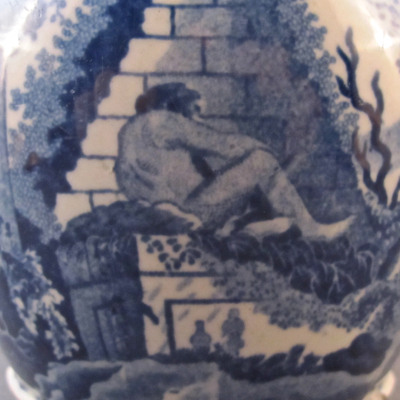 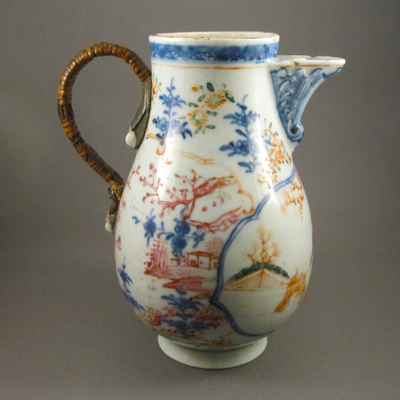 This jug with similar form and decoration shows what my jug might have looked like before its accident. 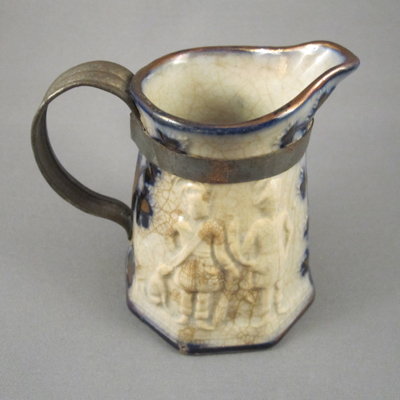 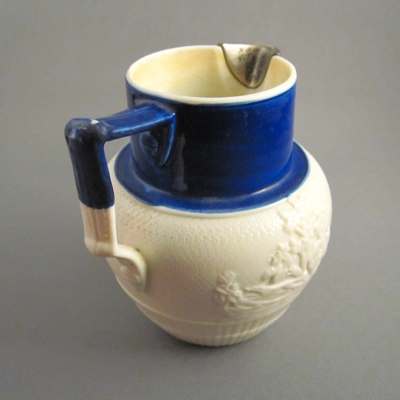 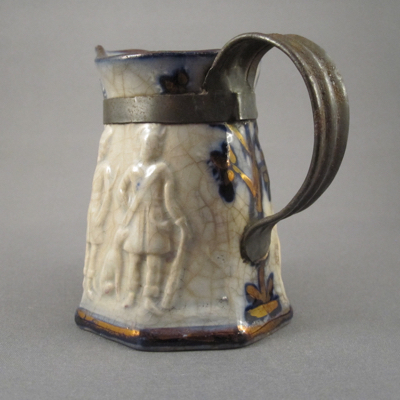 This little pearlware pottery cream jug was made in the unpronounceable village of Ynysmeudwy, Wales during the mid-19th century and was part of a child’s tea set. 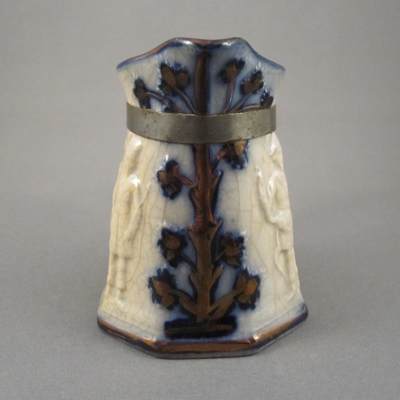 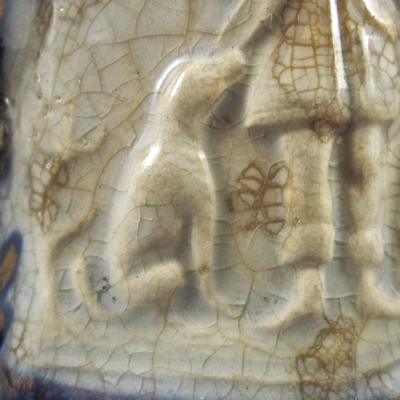 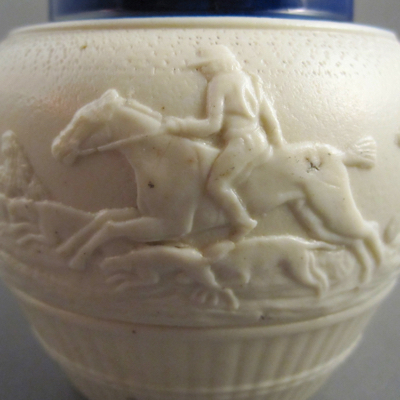 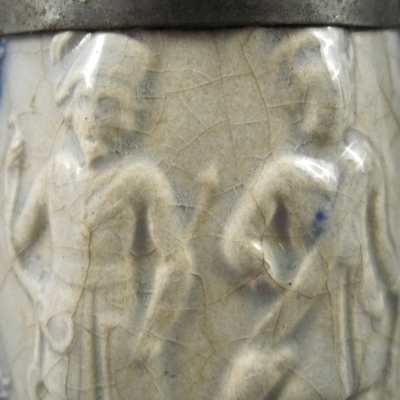 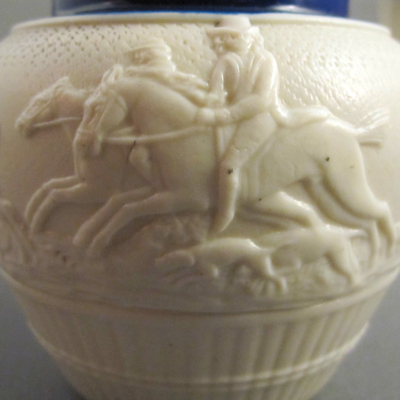 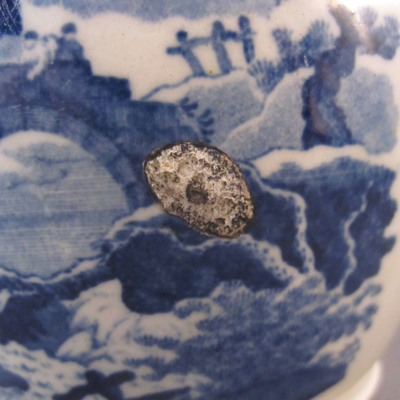 It is decorated with moulded relief of hunters, dogs, and flowers, with flow blue glaze and copper lustre bands at the rim and base. 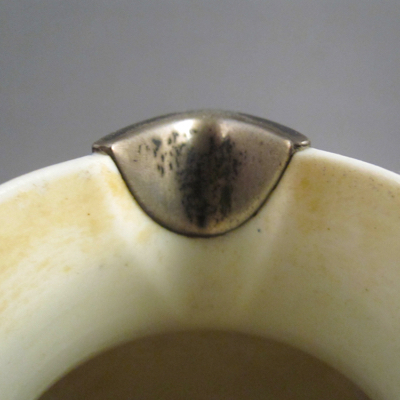 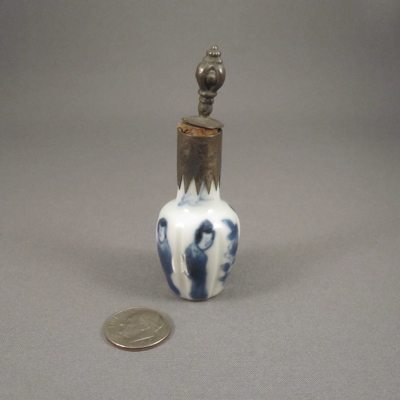 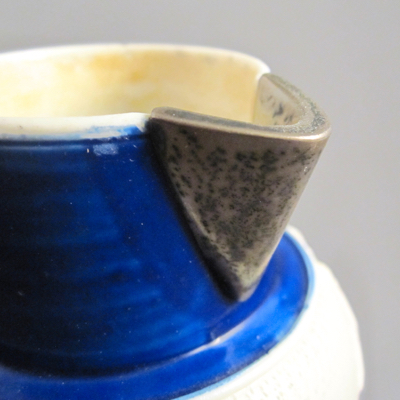 It stands nearly 3.5 inches high and is marked “35” in copper lustre on the underside. 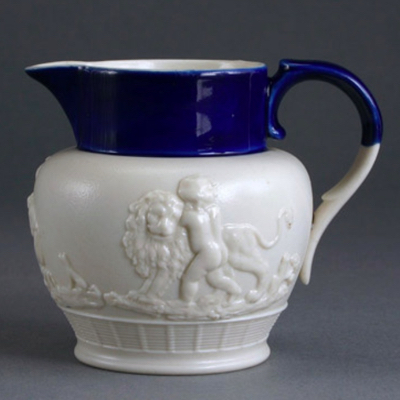 As is true of the many fragile items for children that I have in my collection, this poor jug must have slipped from the hands of a nervous child, who no doubt was told to handle it with care. 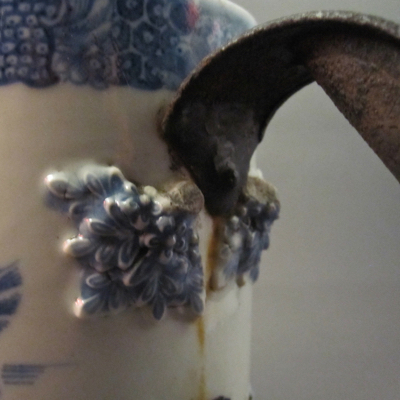 Well over 100 years ago, as a result of the mishap, a tinker made a sturdy metal replacement handle. 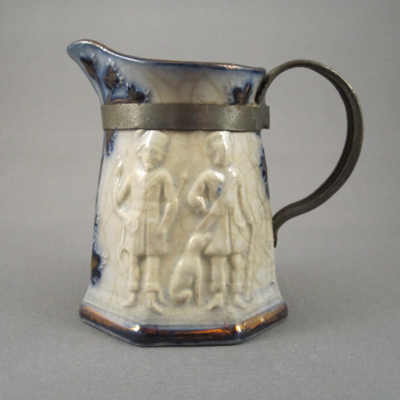 There must have been a lot of pressure placed on small children when they were given delicate playthings like this, and unjustly punished when the inevitable happened. 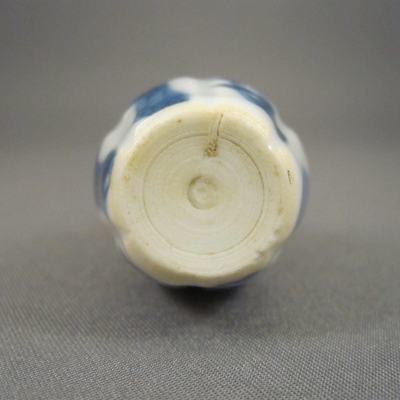 I can just imagine the collective sigh of relief heard worldwide when children were given unbreakable toys made of plastic to toss about as they pleased. 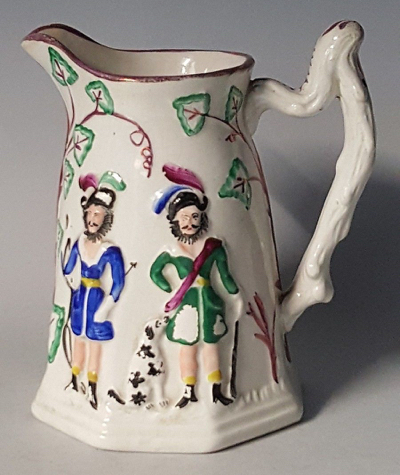 This jug of similar form and decoration suggests what the original handle on mine might have looked like. 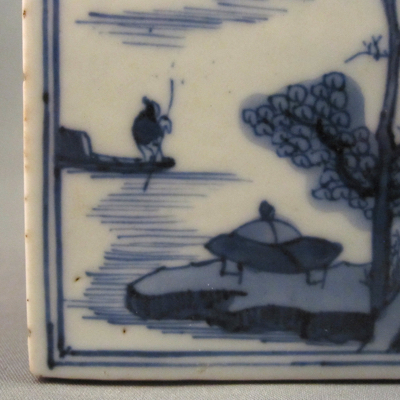 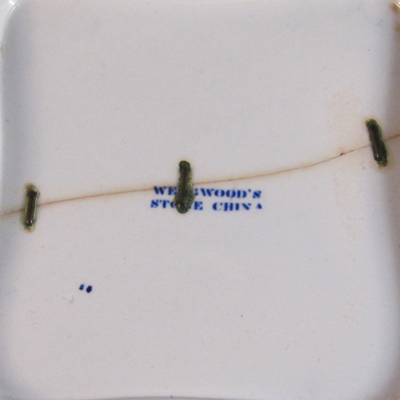 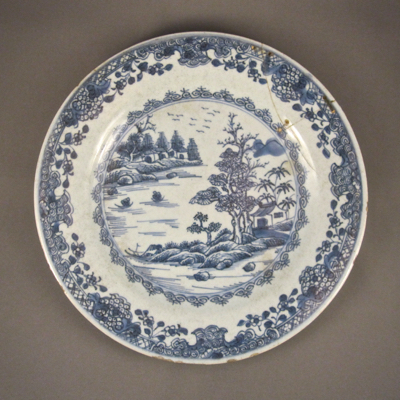 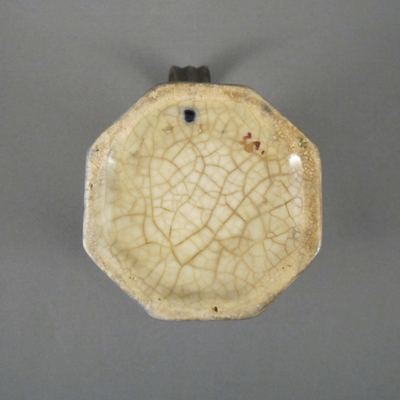 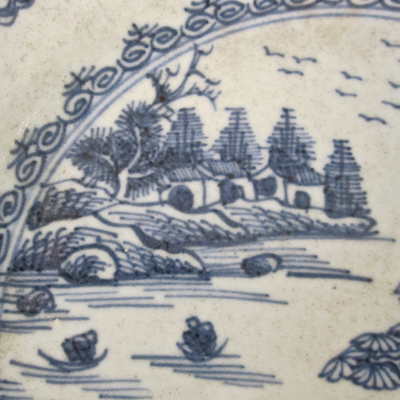 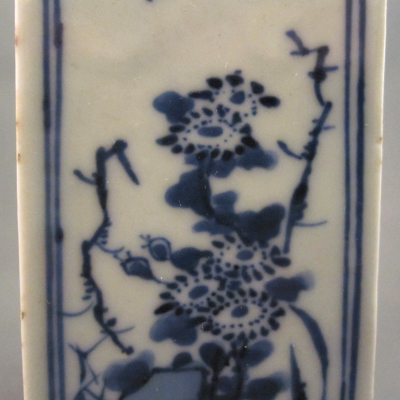 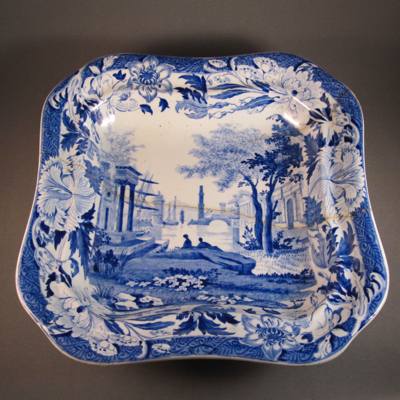 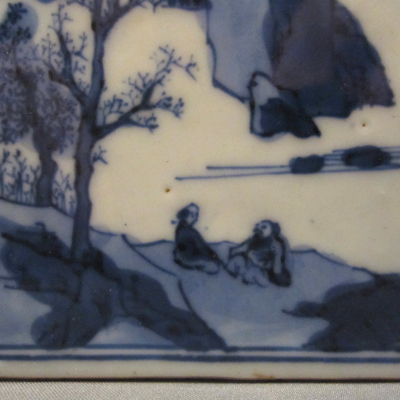 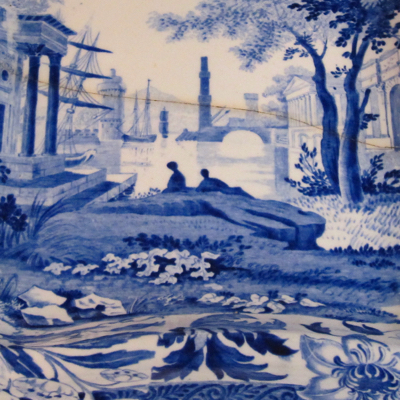 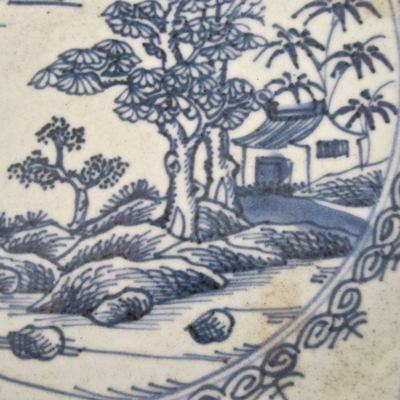 This plate was made in China during the Qianlong period (1736–1795) for export to North America and Europe. 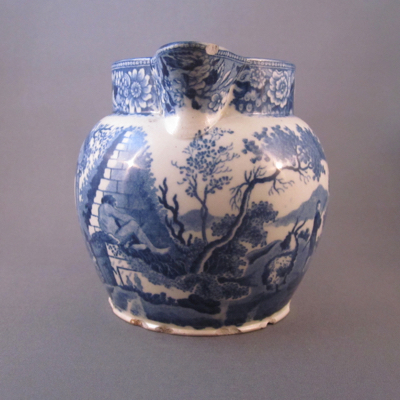 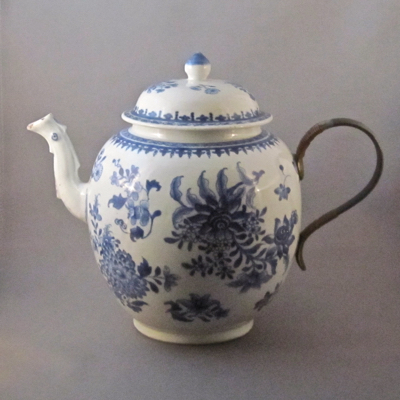 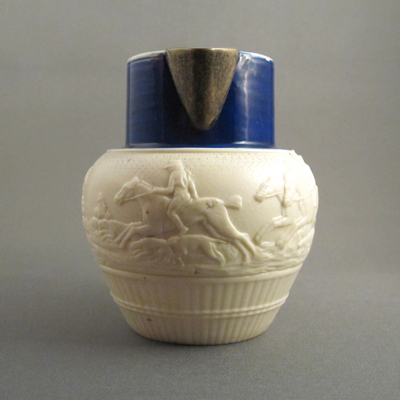 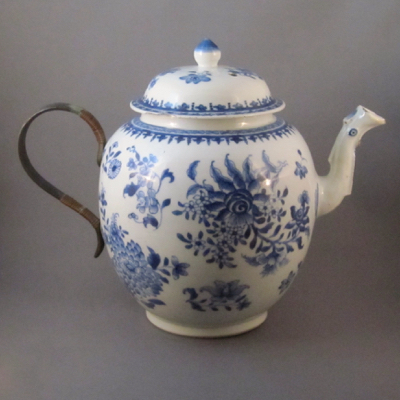 It measures nearly 9.25 inches in diameter and is decorated in cobalt blue over a light blue ground. 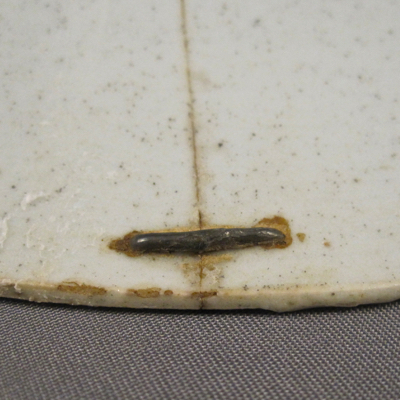 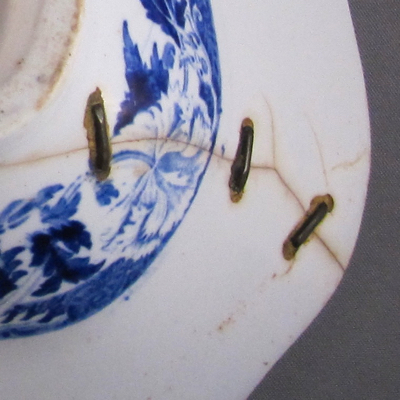 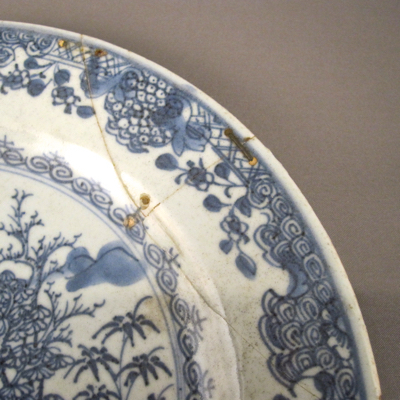 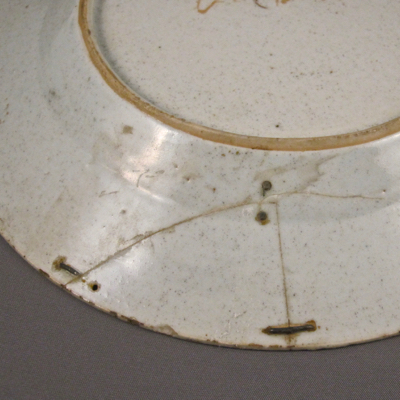 Well over 225 years ago after the plate dropped and a large chunk along the rim broke off, it was taken to a china mender who reattached the broken pieces using metal staples. 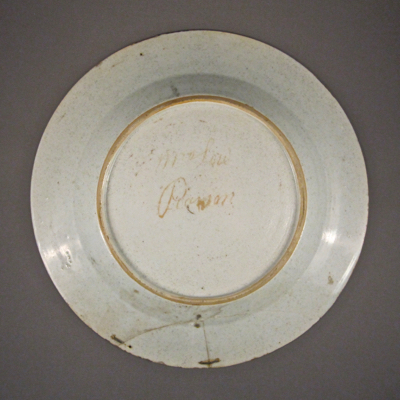 Hand marked in red on the underside is “Mrs. 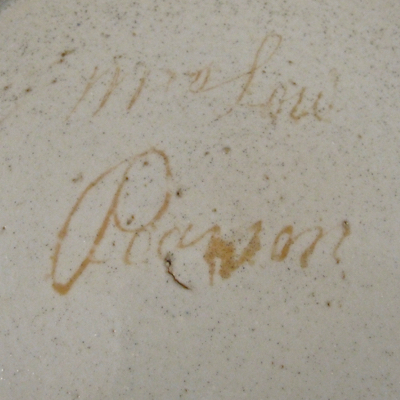 Lou Pearson”, which I assume is the name of the owner who brought the plate in for repair. 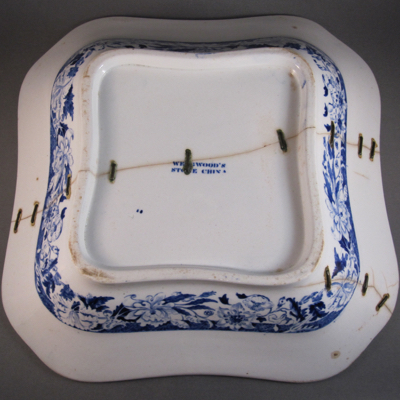 Signed pieces such as this are uncommon and bring us one step closer to the mostly undocumented world of the men and women who did these marvelous, anonymous repairs.